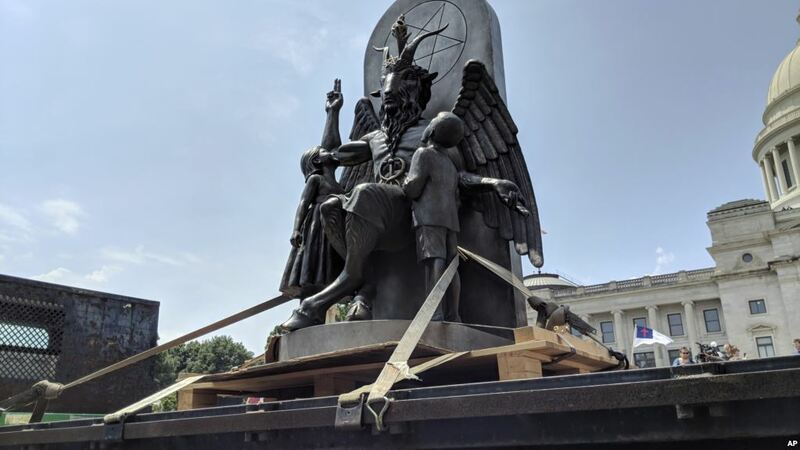 The Satanic Temple unveiled a statue of Baphomet, a goat-like figure associated with Satanism, at the Arkansas State Capitol during a First Amendment rally on Thursday. The rally, intended to protest a Ten Commandments monument that had been installed at the capitol, was attended by Satanists, atheists and Christians, The Associated Press reported. Multiple speakers at the rally called for state government officials to install the statue of Baphomet or to remove the Ten Commandments monument, claiming that the monument violates their constitutional freedom of religion rights. “If you’re going to have one religious monument up then it should be open to others, and if you don’t agree with that then let’s just not have any at all,” said Ivy Forrester, who helped organize the event, according to the AP. However, the statue of Baphomet can’t be installed unless it receives legislative sponsorship under a 2017 law. The Ten Commandments monument received sponsorship from Republican state Sen. Jason Rapert and was also installed in 2017. However, the monument was destroyed a day after it was installed by a man who rammed his car into it. “It will be a very cold day in hell before an offensive statue will be forced upon us to be permanently erected on the grounds of the Arkansas State Capitol,” Rapert told the AP. According to the news outlet, nearly 150 people attended the rally Thursday, which had a noticeable police presence.